Blog - Big on History, Low on Premium! Big on History, Low on Premium! 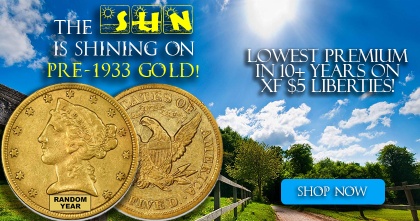 Of all bullion items, vintage U.S. gold coins represent some of the smartest values. Much like 90% silver, vintage American gold coins have a finite supply. In quiet markets like today, these coins can be scooped up for modest premiums. However, when demand heats up, premiums often rise dramatically. One of best buys right now is the $5 Liberty Half Eagle. These coins carry an official face value of $5, were issued from 1839 through 1908, and contain approximately 1/4 oz of pure gold. We bought a nice "deal" of coins in Extremely Fine ("XF") condition, meaning they show just a minor amount of wear. These are nice problem-free specimens that we personally screened for quality. Plus, there's an excellent variety of dates -- more on that shortly. Today, your cost is just a minuscule amount over melt -- a remarkable value for a 100+ old gold coin in respectable condition! Premiums are the lowest we can remember in well over a decade! This is a fantastic combination of a low spot price and a low premium. Not only is gold trading at a 60-day low, but this is one of the lowest premiums we've seen in years. As an added bonus, we ended up with an outstanding variety of dates in this mini-hoard of XF $5 Libs. If you order 3+ coins, we'll make sure you receive 3+ different dates. Orders of 5+ will receive 5+ different dates. Take advantage of low spot, low premiums, and an outstanding variety of dates!